McCarthy life’s work, which he has been creating since the 1960’s, was inspired by “primal themes” in American society and is characterized by irony, unmasking and the grotesque, as well as a complex nexus of interaction between media and materials. He makes use of Disneyland, comics, Hollywood and set pieces from art history. In his content-packed performances – which strain the limits of endurance – conceptual art, action painting, surrealism and minimalism seem to shift space. McCarthy introduces moments of the uncanny, of dislocation in space or masquerade, a situation that is reflected in the almost stage-like, three-dimensional collage “The Box” (1999): an oversized wooden box, into which McCarthy has built his entire studio, i.e. the setting for his creativity and the production of his artworks. The installation appears outwardly to be an inconspicuously simple trunk, yet inside a stunning variety of things that reference not only McCarthy himself, but his extensive creations from the beginning of his career to the present as well. The box with over 3,000 fixed objects from his studio – tables, equipment, tools or boxes – is tilted 90 degrees. Due to the rotation, it becomes an almost surreal spatial experience. This ties into McCarthy’s radical performance art and opens up new perspectives on the creative space. 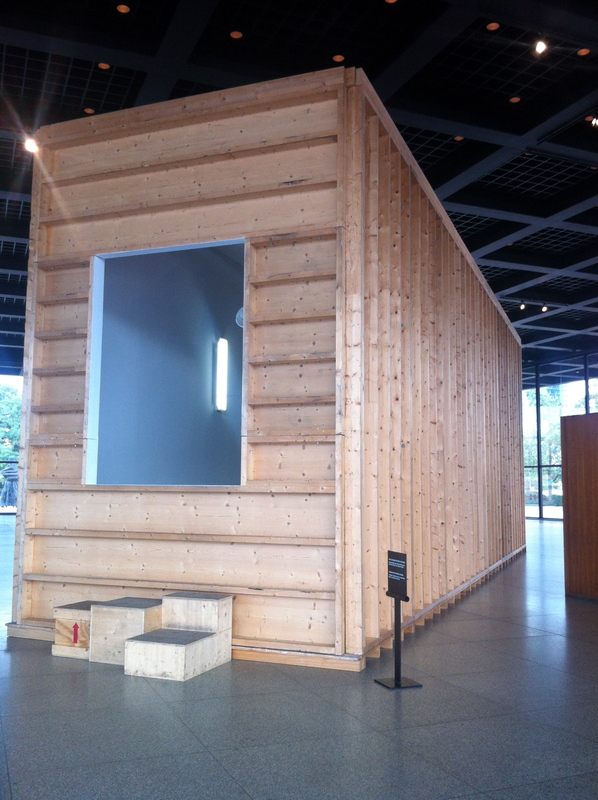 As the single work exhibited in the expansive hall, “The Box” is granted particular significance. The narrowness of the studio – the private space – meets the expansiveness of the surrounding – the public space. At the same time, this artwork relates to the collection housed in the Neue Nationalgalerie, which is exhibited in the basement. Specific points of connection can be found to the cultural assemblage from the 1960’s exhibited here (Daniel Spoerris “Snare-picture”) or Bruce Nauman‘s early studio videos (“Bouncing in the Corner”). The view into the studio, a constantly recurring theme by modern artists, is in this version by Paul McCarthy the portrait of an unsparing artist who is willing to reveal everything. This entry was posted in Art Centre, Collage, Exhibition, Installation and tagged Neue Nationalgalerie, Paul McCarthy.